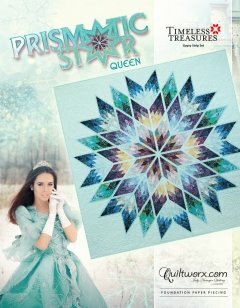 The Prismatic Star Queen foundation papers and strip piecing processes were designed by Quiltworx in 2014 as part of a wall quilt layout called the Prismatic Star. The Queen Layout was created and published due to popular demand. The Prismatic Star block teaches a basic strip piecing process that is used in most of our star quilts and required 2-1/2” strips. The block is used in a 91” x 91” layout that includes (48) diamonds and a background. The block can be mixed and matched and rotated with other similar sized diamond blocks using an online fabric and block auditioning application called Quiltster. Compatibility: This pattern is NOT compatible with the previously published Prismatic Star wall quilt. During design of the queen layout, Judy realized that adding a 3rd group of diamonds significantly increased the difficulty of final assembly over the original wall quilt size. She reviewed the pattern elements and realized that increasing the size of the sashing strips and alternating how they were sewn to the 4 x 4 diamond block removed hours of frustration in final assembly due to stacked seams and matching complicated intersections. As a result, the Prismatic Star Queen units are not the same size as the original pattern. We will also be updating the wall quilt pattern soon, so that the two sizes will be compatible. This pattern cannot be purchased (in whole or in part) to expand the previously published design.